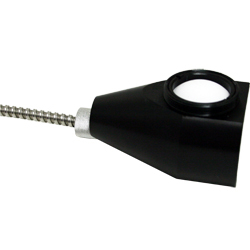 Featuring a diffuser made from PTFE, the FRC100 can be used from the UV to the NIR range. When compared to integrating spheres, the FRC100 provides greater optical efficiency and improved signal sensitivity over a broad spectral range. A 600mm fiber patch cord with metal sheathing is provided which connects to the SMA 905 connector on the FRC100 and to a spectrometer on the other end. A working setup would consist of purchasing an FRC100, spectrometer, and irradiance calibration.